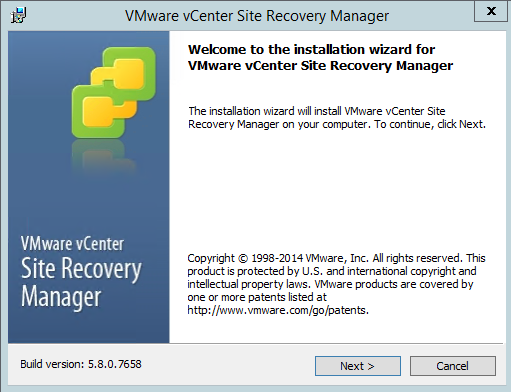 In this article we will show you how to install VMware Site Recovery Manager 5.8. 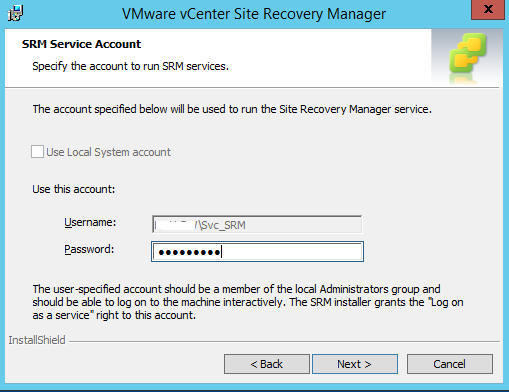 This step by step guide will help you to understand the design, installation, operation and architecture of setting up VMware Site Recovery Manager (SRM) 5.8. 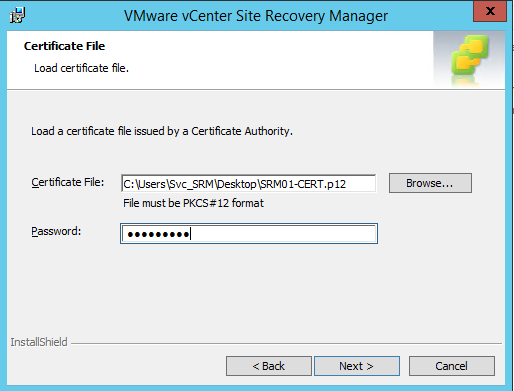 VMware Site Recovery Manager consists of several different pieces that all have to fit together, let alone the fact that you are working with two different physical locations. 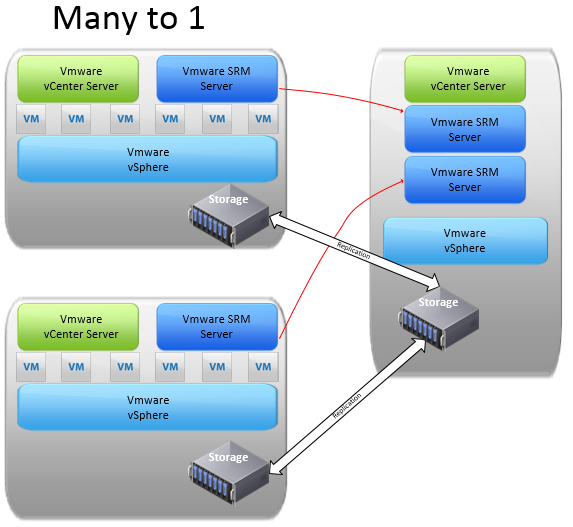 It’s worth noting that SSO, vCenter, and SRM could all be installed on the same machine, but you’ll need this many instances of these components. 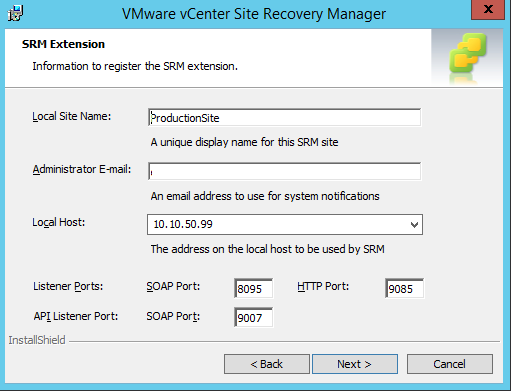 As of VMware Site Recovery Manager 5.8 you can do a traditional Protected to Recovery Site implementation like the one shown below. 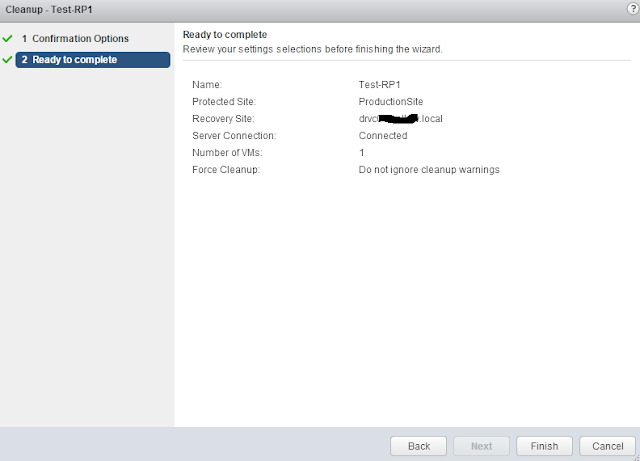 This can be a unidirectional setup with a warm site ready for a failover to occur, or it can be bi-directional where both sites are in use and a failure at either site could be failed over to the opposite site. 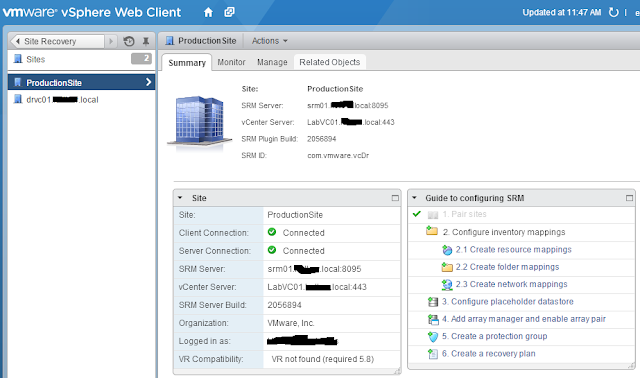 Each site will require their own vCenter Server and SRM Server, as well as a method of replication such as a storage array. 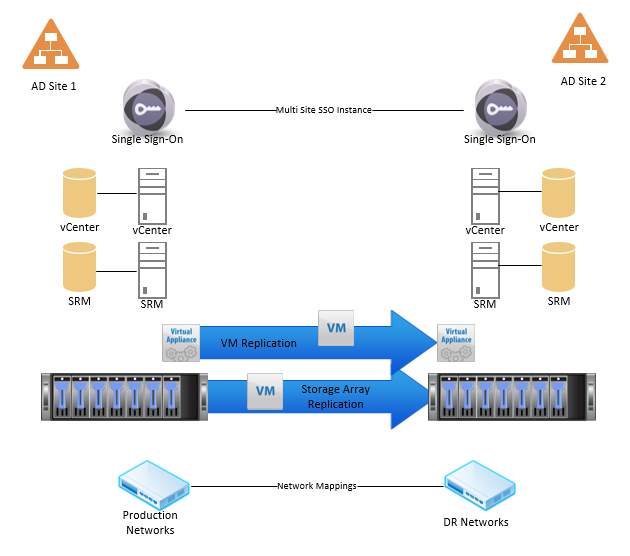 Along with a 1 to 1 setup, SRM 5.8 can manage a many to one failover scenario where multiple sites could fail over to a single site. 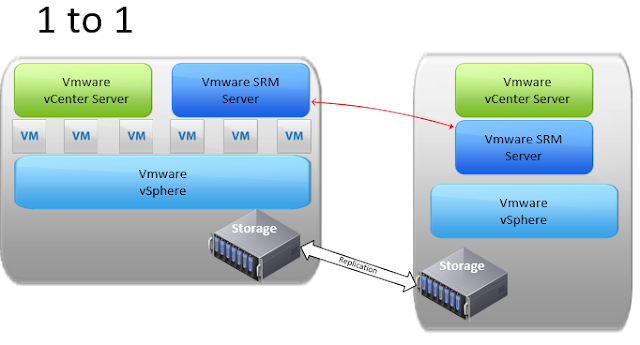 This would require an SRM instance for each of the protected sites as seen in the diagram below. 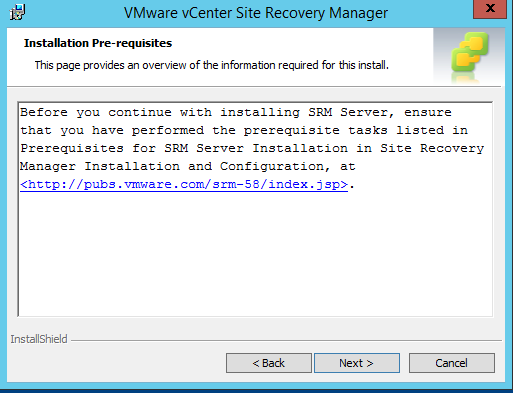 We’ve now installed SRM and configured the sites. We can now start looking at setting up replication and protection groups in the next step. 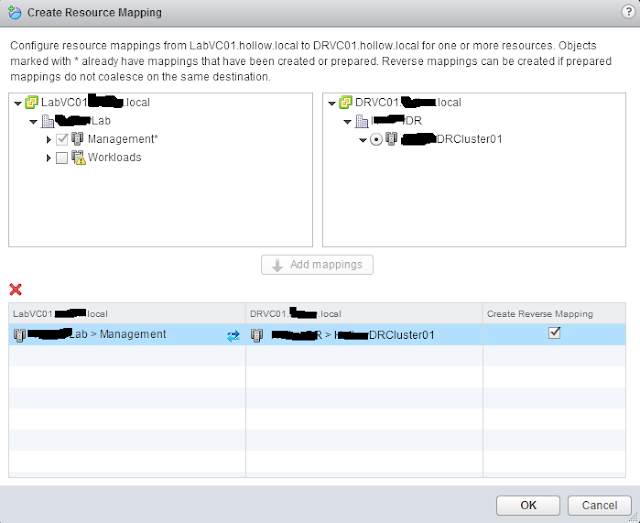 SRM Sites and resource mappings are all done. 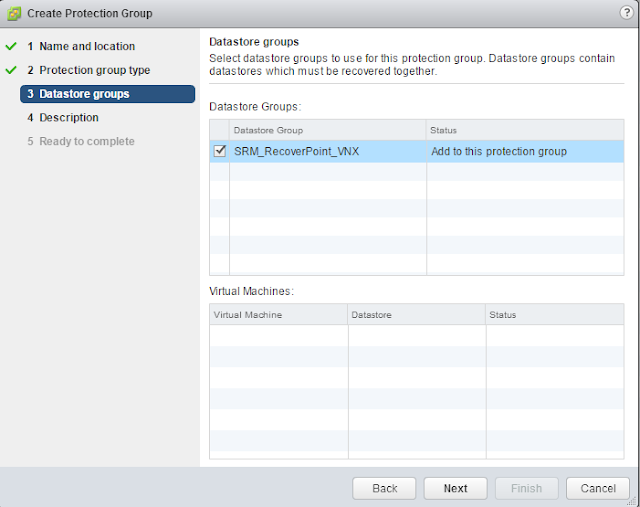 It’s time to create some Protection Groups for our new VMware Site Recovery Manager deployment. 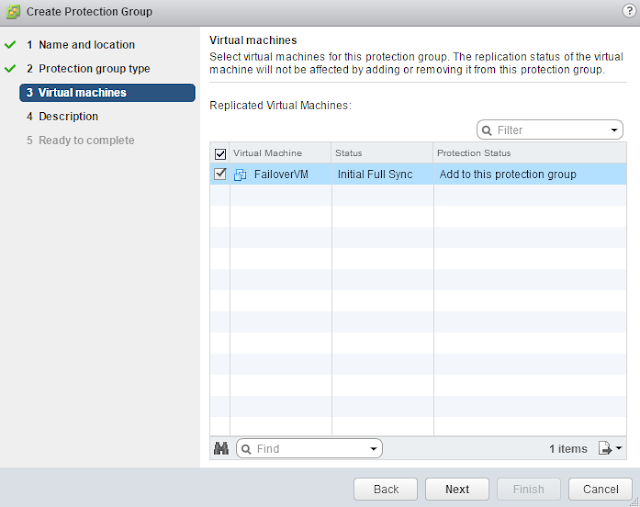 A protection group is a collection of virtual machines that should be failed over together. For instance, you may want all of your Microsoft Exchange servers to fail over together, or you may want a Web, App, Database Tier to all failover at the same time. 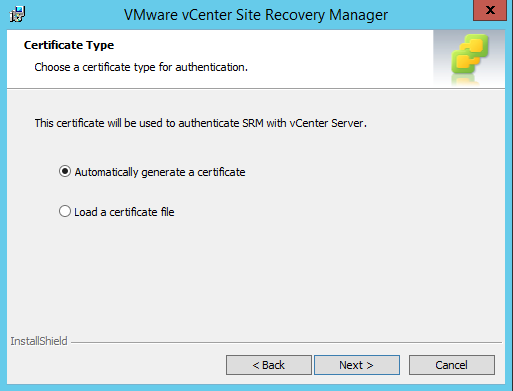 It is also possible that your main goal for SRM is to protect you in the event of a catastrophic loss of your datacenter and you’re concerned with every VM. It still a good idea to create multiple protection groups so that you can fail over certain apps in the event of an unforeseen issue. Think about it, if your mail servers crashed but the rest of your datacenter is fine, would it make sense to just fail over the mail servers, or the entire datacenter? Just failing over the mail servers would make sense if they are in their own protection group. 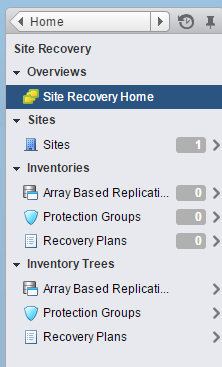 If we look at the protection groups menu of Site Recovery we’ll want to click the shield icon with the “+” sign on it. Give the new protection group a name. Of course give it a descriptive name. A name like “Protection Group 1” doesn’t work very well when you have lots of protection groups. Name it something easy to identify. 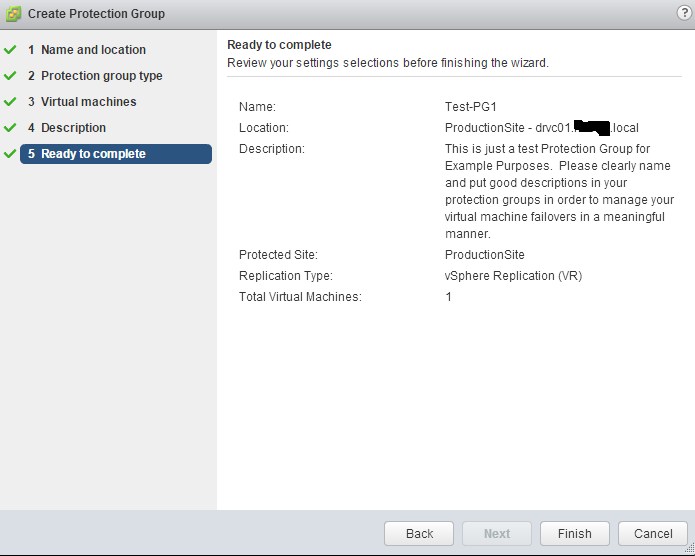 Back to my examples, I’ve named my protection group, “Test-PG1”. Yep, I’m a hypocrite. Click Next. Select the Protected Site and a replication strategy. 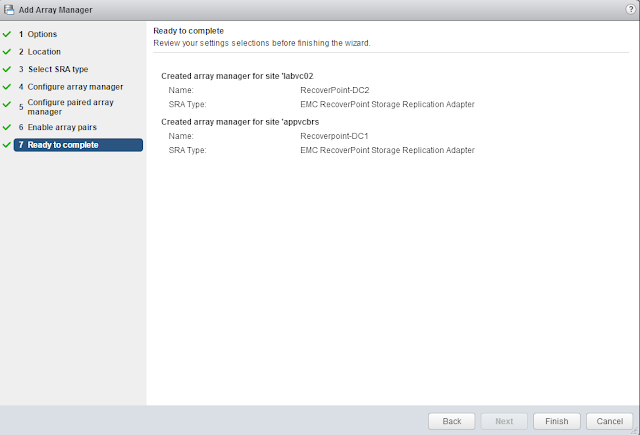 In my lab, I’ve setup vSphere Replication so I’ve chosen that as my replication type. Click Next. 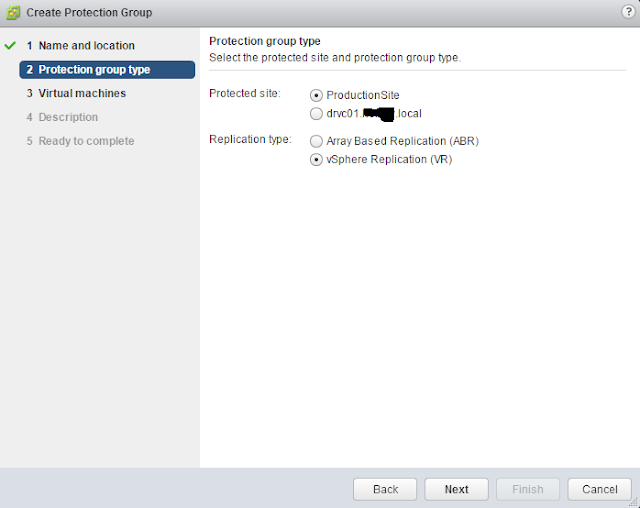 NOTE If you are using Array Based Replication, make sure that you don’t have multiple protection groups on the same LUN or consistency group. 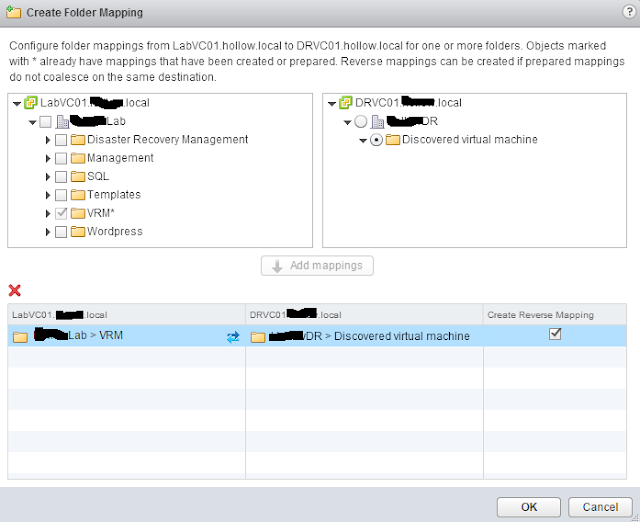 The entire LUN would be taken offline during a failover of a protection group, so having some VMs that aren’t supposed to failover on the same LUN could cause you an issue. 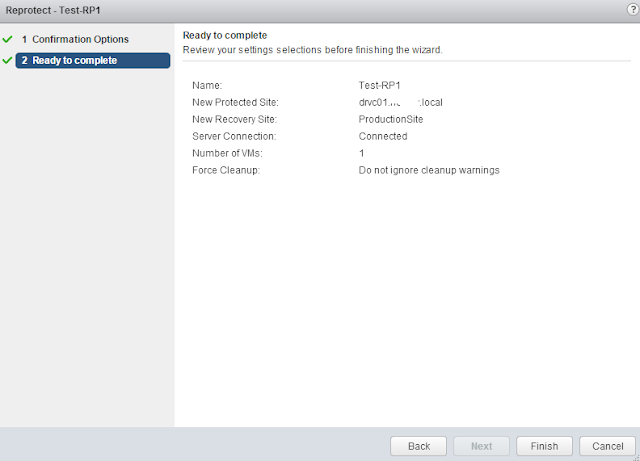 Select the Virtual Machines to fail over. 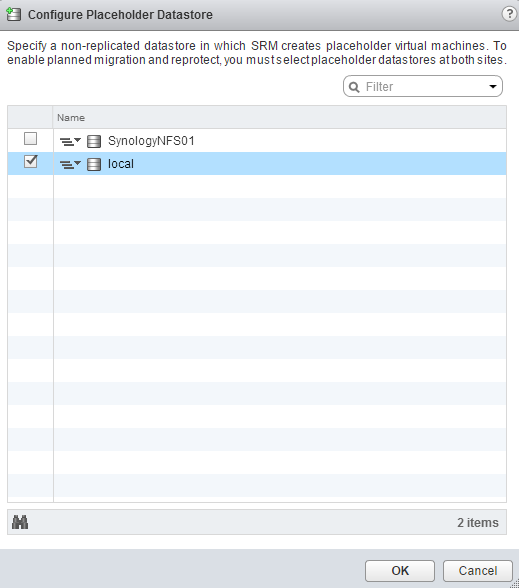 The populated list will only show virtual machines that are being replicated. 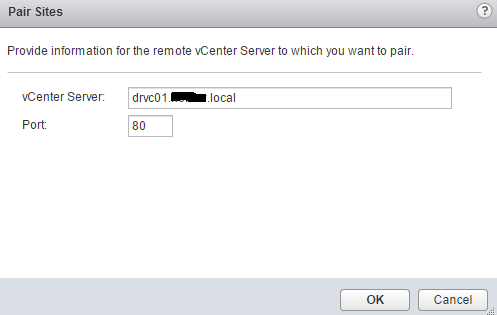 As you can see from the screenshot below, the VM named “FailoverVM” is available for protection even though I have many VMs in my vCenter. 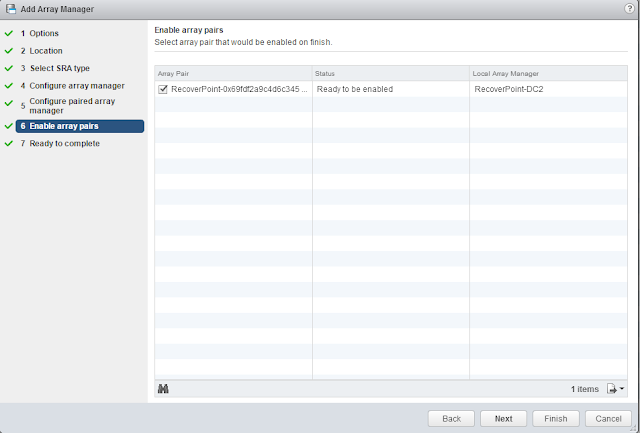 “FailoverVM” is the only one that is being replicated. Click Next. 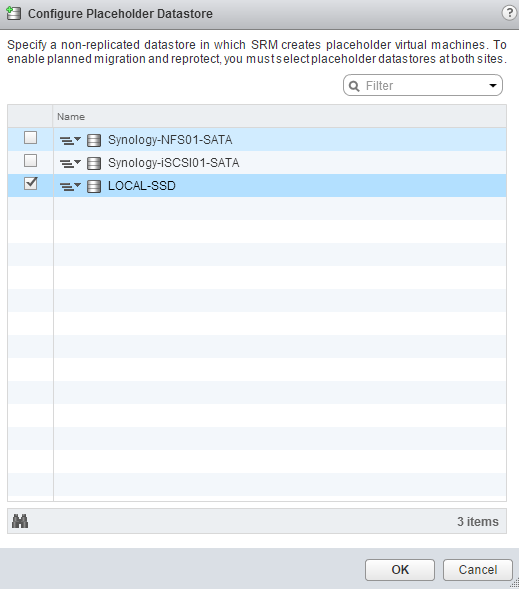 NOTE: If you are using Array Based Replication, you will be selecting a datastore vs individual virtual machines. The same rule about replication holds true, however. 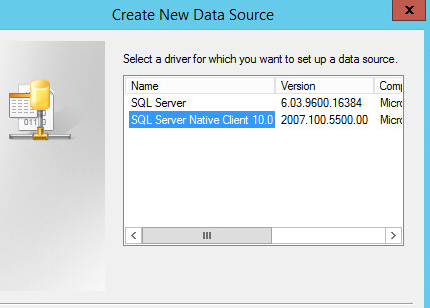 Only replicated datastores should show up in this menu. Give the Protection group a good description. Click Next. 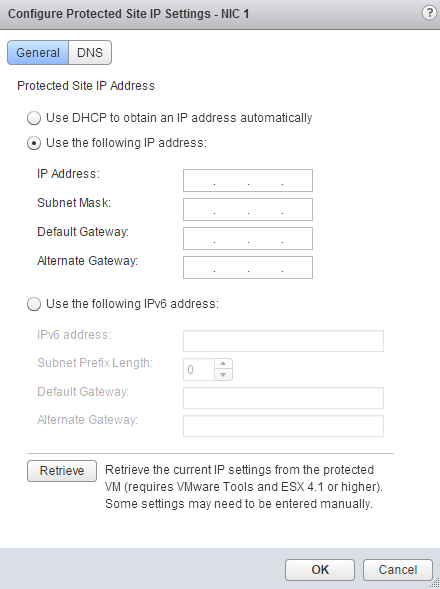 Review the Protection Group settings and click Finish. 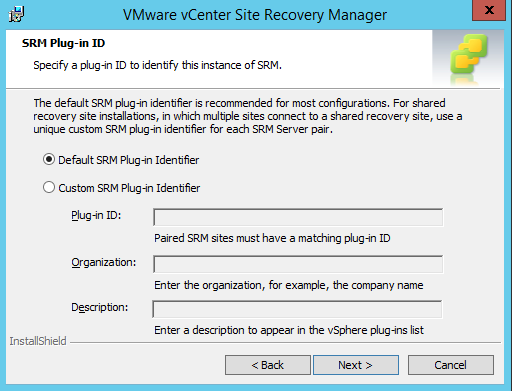 Protection groups are simple to setup in Site Recovery Manager, but could take a considerable amount of planning to make sure VMs are in the correct LUNs. 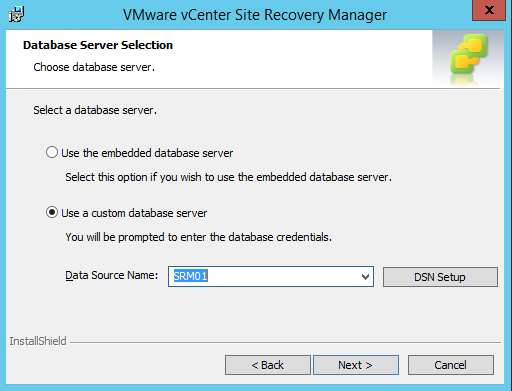 The planning of your entire disaster recovery plan should be designed with this in mind. 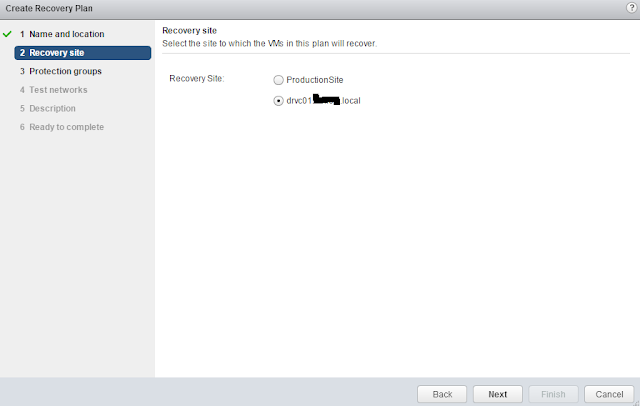 A recovery plan is the orchestration piece of Site Recovery Manager and likely the main reason for purchasing the product. All of the setup that’s been done prior to creating the recovery plans is necessary but the recovery plan is where magic happens. 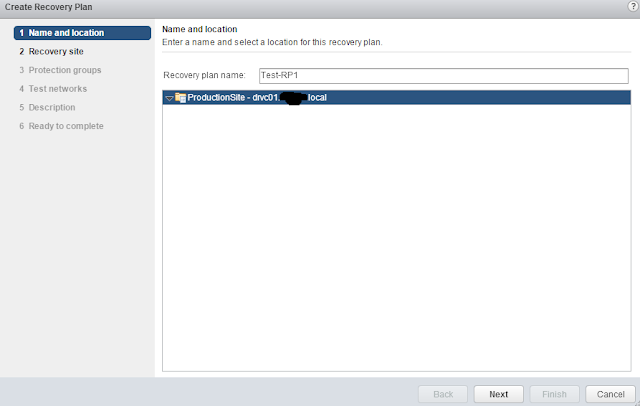 When we go to the Recovery Plans menu in Site Recovery, we’ll see the option to click the notepad with the “+” sign on it to create a new recovery plan. 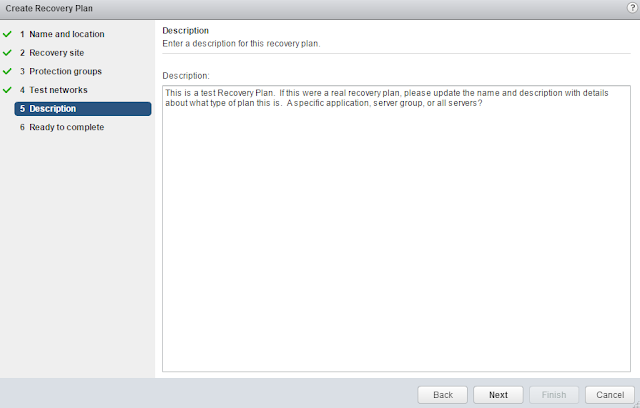 Give the recovery plan a descriptive name. 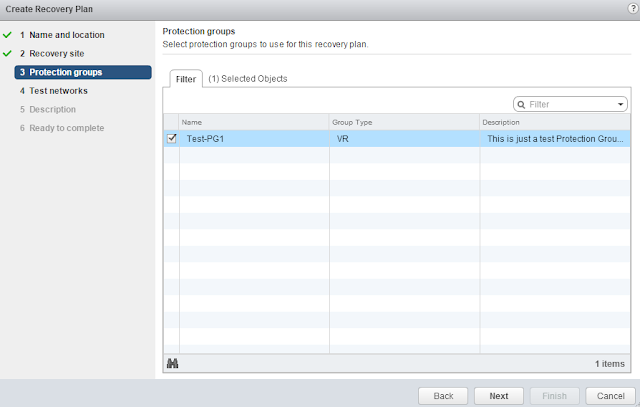 Remember that you can create a recovery plan for individual protection groups, or multiple protection groups. 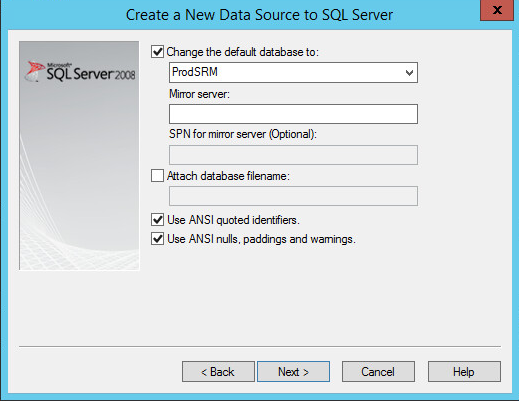 This allows you the opportunity to create individual recovery plans for things like “Mail Services”, “Database Services”, “DMZ”, “File Servers” and then create a catch all named “Full Recovery” that includes all of the protection groups. This allows for flexibility with whatever outage you’re planning for. 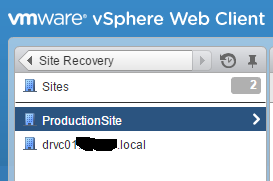 Choose which site is the recovery site and click Next. Select the Protection Groups that are part of this recovery plan. 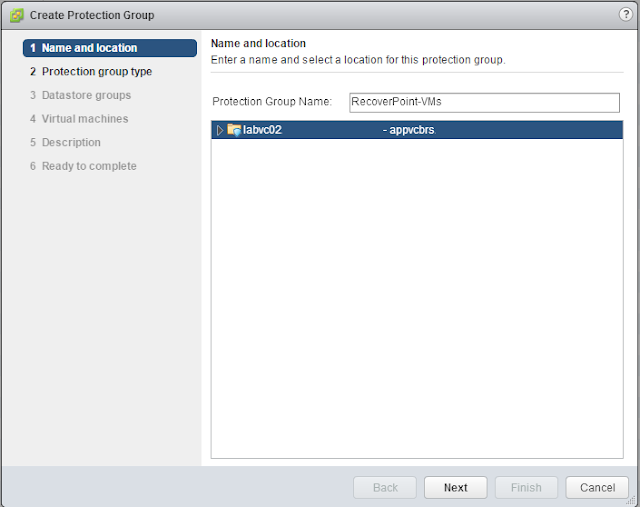 In the example below, there is only one protection group, but you could select many if they are available. Click Next. 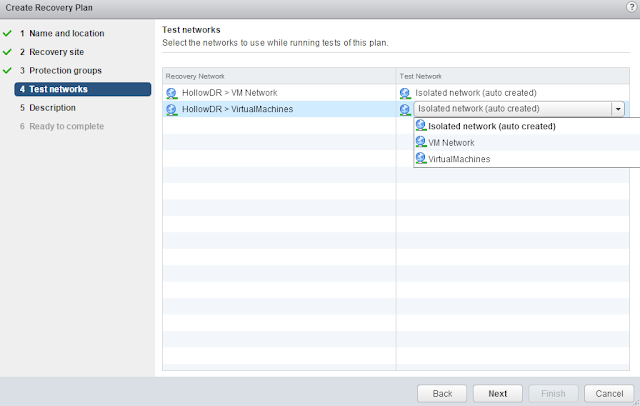 Select the test networks. 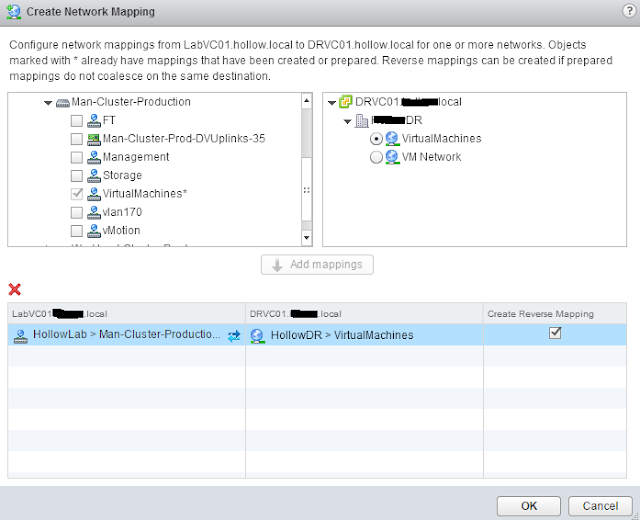 We’ve already created mapping for networking that should show handle what happens when a virtual machine fails over to the recovery site, but we need to configure what happens when we run a “TEST” recovery. 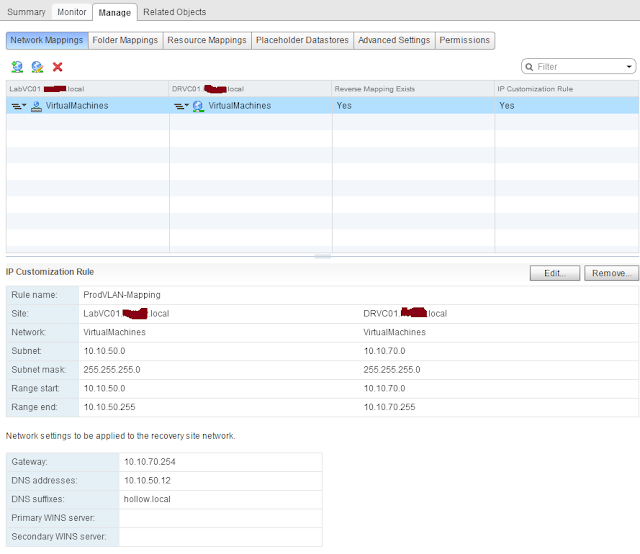 During a failover test, we may not want the VM to be on the same network as our production servers. 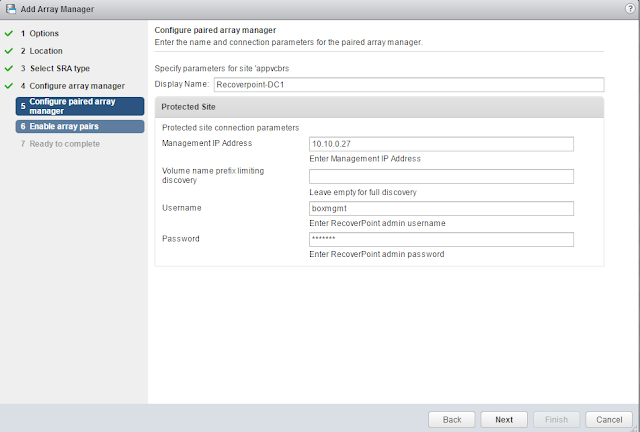 Leaving the “Isolated network (auto created) as the test network, allows us to create a virtual switch with no uplinks in order to ensure that the virtual machines won’t be accessible via the network during a test. 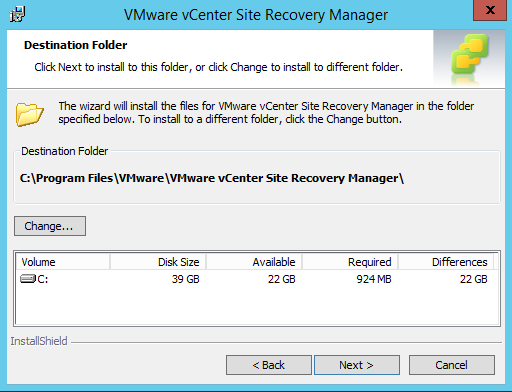 Give the recovery plan a description and click Next. 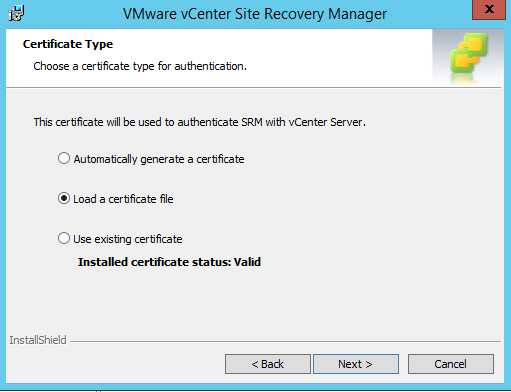 Once done, we can see that a Recovery Plan is available and we can run a test or a failover. This is the basic layout of a recovery plan. 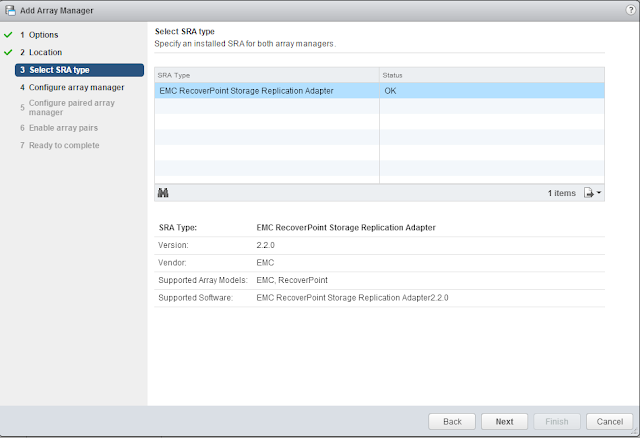 Most disaster recovery plans require a lot more customization than just powering on a virtual machine at another location. 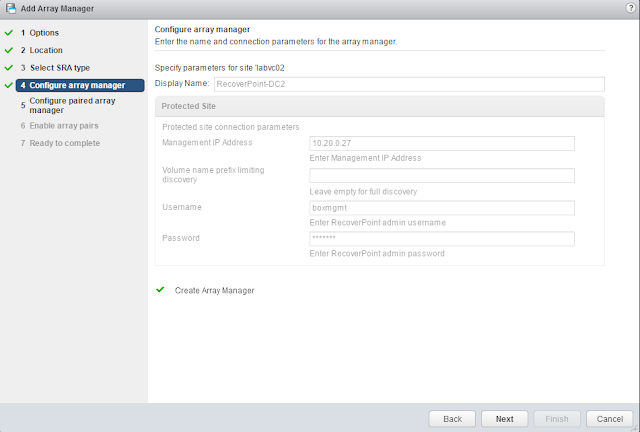 In upcoming steps we’ll review many more options that are available when setting up a recovery plan such as IP customization, power-on priorities and scripting. 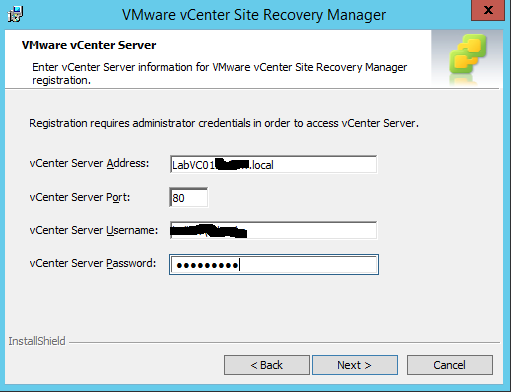 It’s time to failover your datacenter to your disaster recovery site. Well, maybe you’re just migrating your datacenter to a new one, but this is always a bit of a tense situation. Go to the Recovery Plan and click the monitor tab. Click the “BIG RED BUTTON” (yeah, it’s not that big, but it has big consequences). 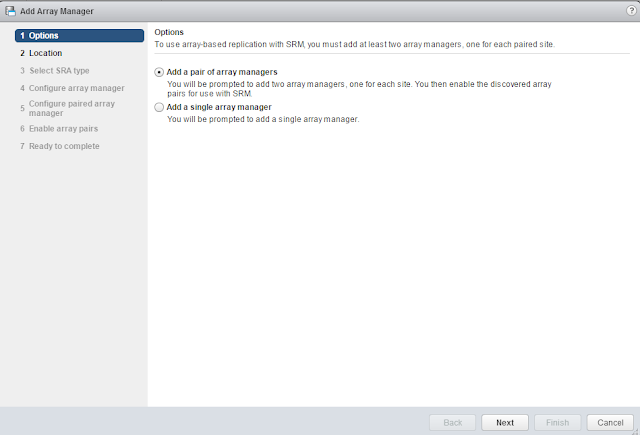 Before the failover actually happens, you’ll be given a warning and you actually have to click a check box stating that you understand the consequences of performing this operation. 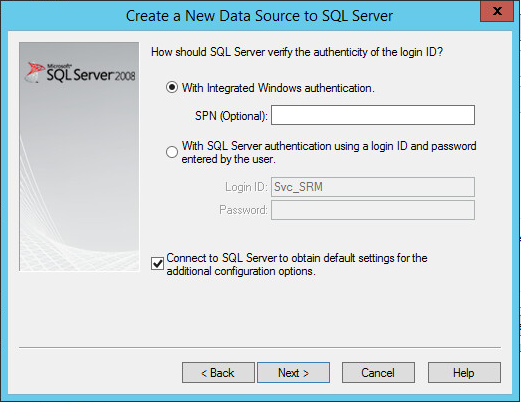 After that you’ll be given the opportunity to do a Planned Migration which will try to replicate the most recent changes and will stop if an error is encountered, or a Disaster Recovery migration which will just failover anything it can and as fast as it can. 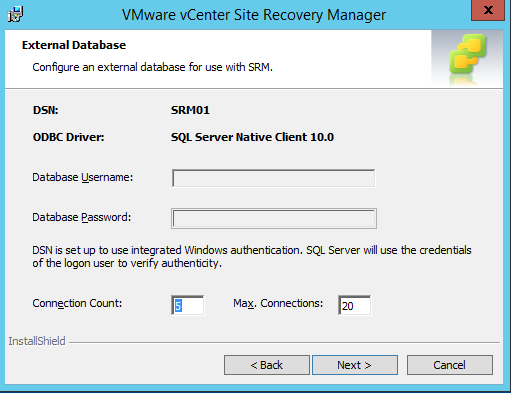 Pick your recovery type and click Next. Review the process that is about to happen and click Finish. 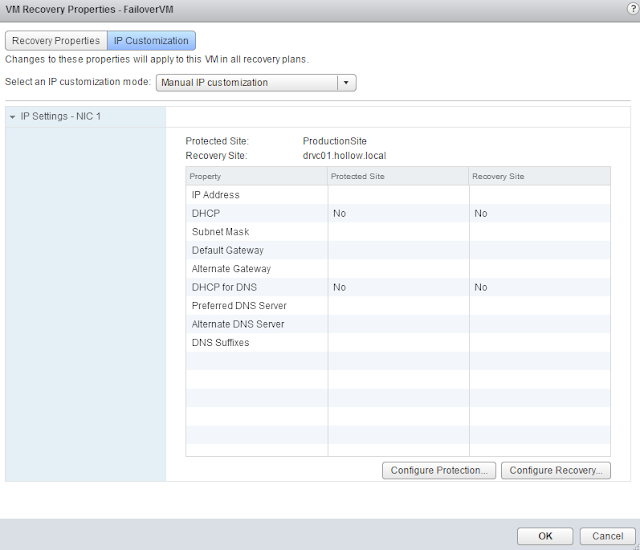 While the recovery is running, you’ll be able to monitor the process on the recovery steps screen. 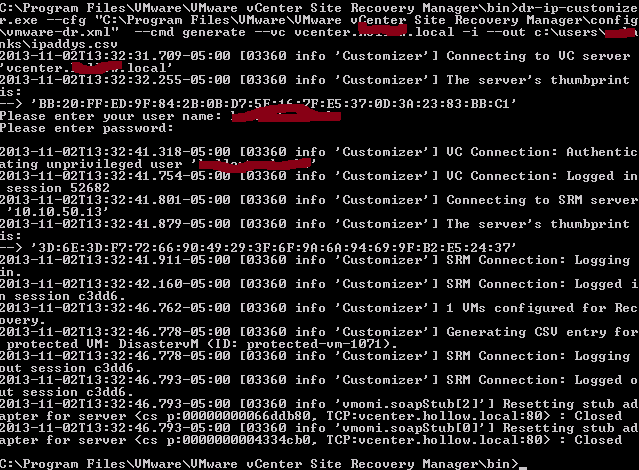 Notice that this is slightly different from a test recovery in a few places, such as not creating a writable snapshot but rather making the existing storage writable in the new datacenter. 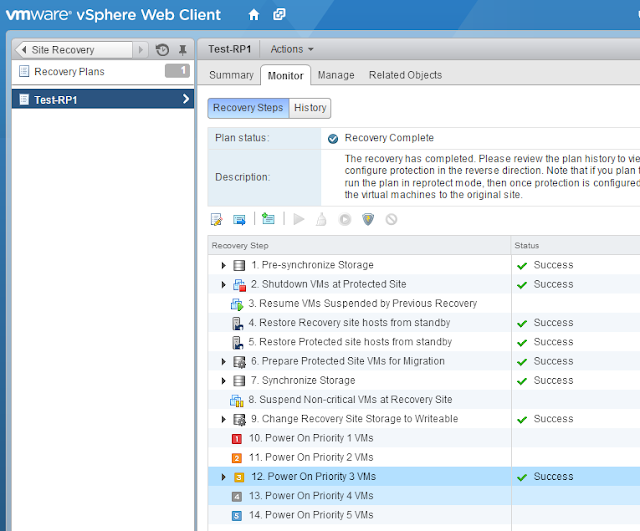 Hopefully everything is working well for you after the failover. Now it’s time to go back to our original datacenter. Click the “Re-Protect” button which looks like a shield with a lightning bolt on it. 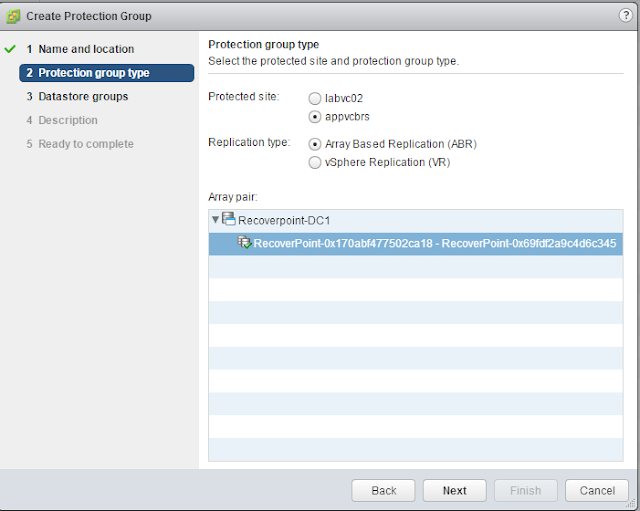 This Re-Protect will reverse the direction of the replication and setup a failover in the opposite direction. You can consider the DR site to be the protected site and the original production site to be the recovery site, until you fail back. 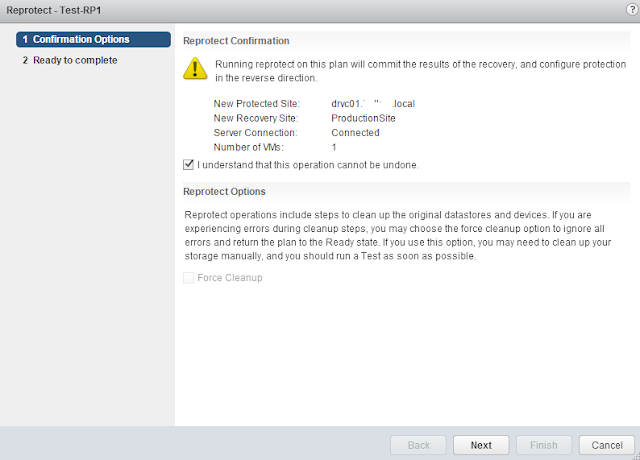 When you run the Re-Protect, you’ll need to once again confirm that you understand the ramifications of this operation. 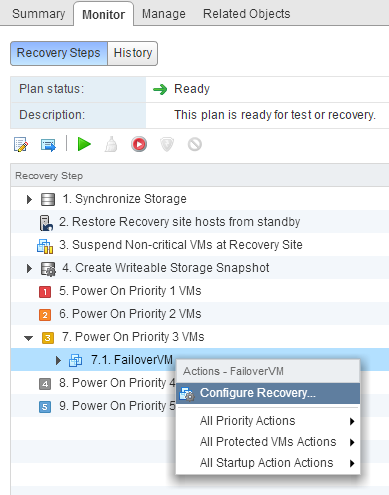 Now that everything is reversed, you can run another failover, but this time a “Planned Migration” is probably more reasonable since you’re likely planning to do a failback and it’s not a second disaster, this time at your disaster recovery site. 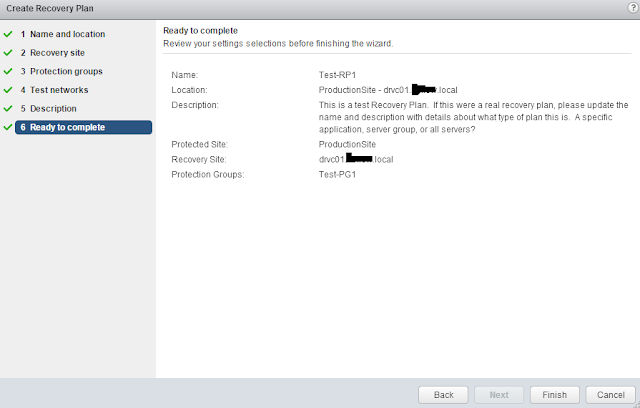 Review the failover and click Finish. 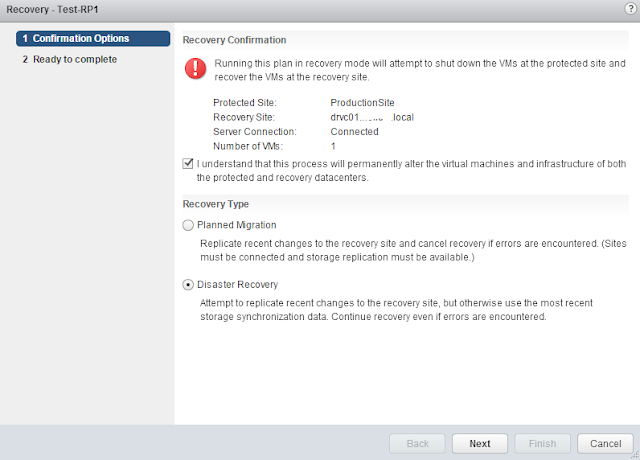 When the failover is done, be sure to Re-Protect it again to get your disaster recovery site back in working order. Failovers can be stressful but thankfully we’ve tested all of our plans before, so that should take some of the pressure off. 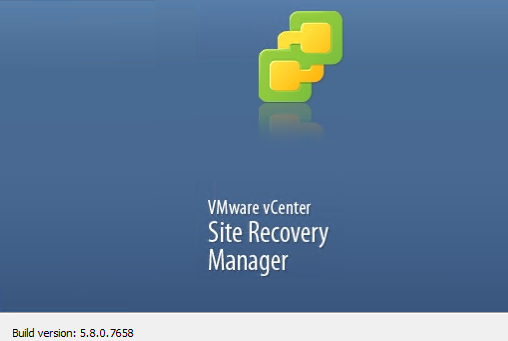 Open up one of your recovery plans and click the monitor tab. 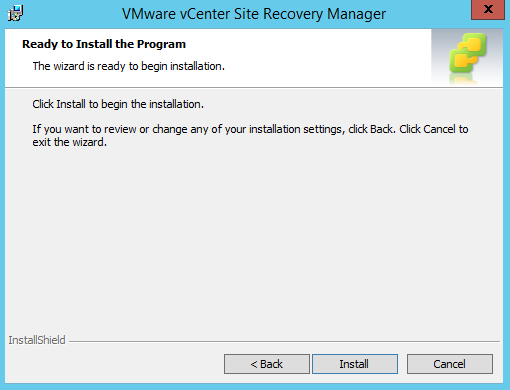 Here you’ll have several buttons to choose from as well as seeing the list of recovery steps. 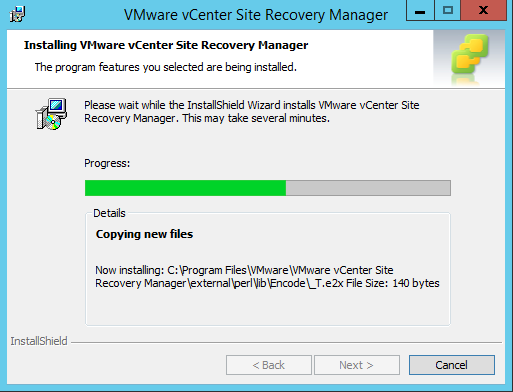 To run a “Test” recovery click the green arrow button. Once you’ve begun the test process, you’ll be prompted about whether or not you want to run one additional replication to the DR site. You’ll have to decide what you’re testing here. If it’s a disaster test, then you probably don’t want to run an additional replication because you can’t hold off your disaster until you replicate one more time. 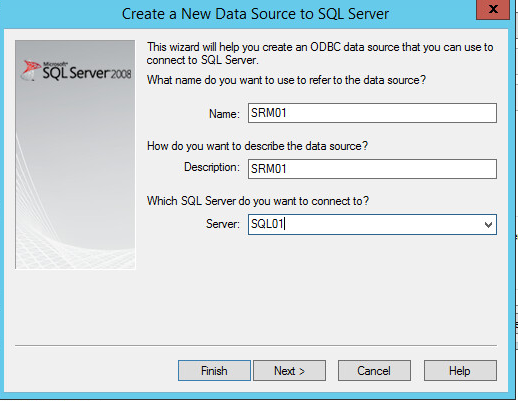 If you’re test is for a planned datacenter migration then maybe this is applicable to you. 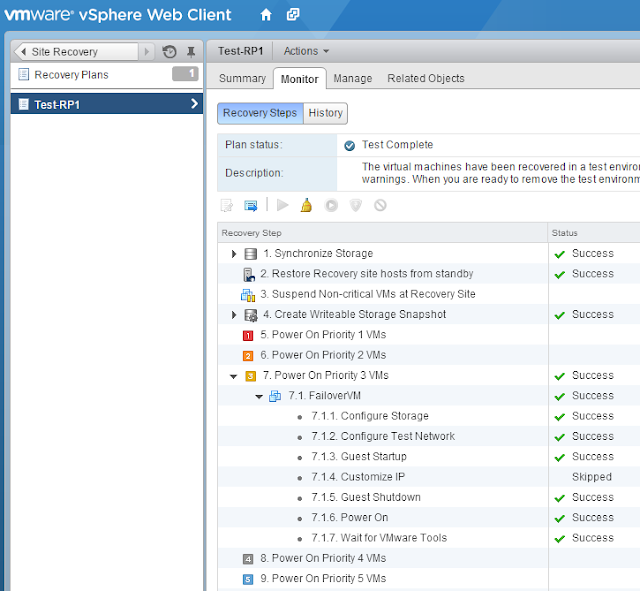 Review your test settings and click Finish. 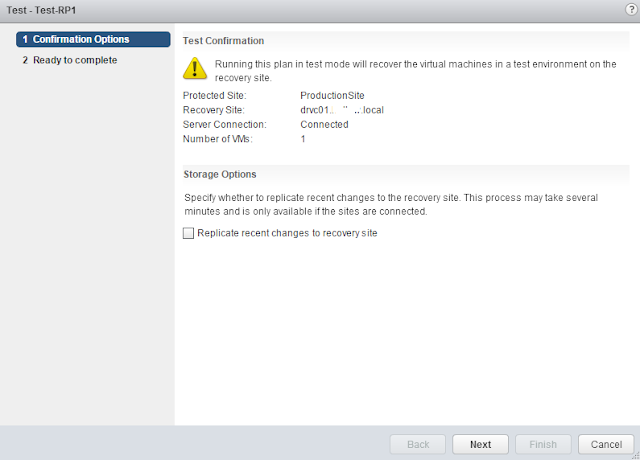 Once the test starts, it will create a snapshot of the storage at the DR site so that replication can continue in the background while the test is run. It may also create some new virtual switches if you’re running an isolated test. 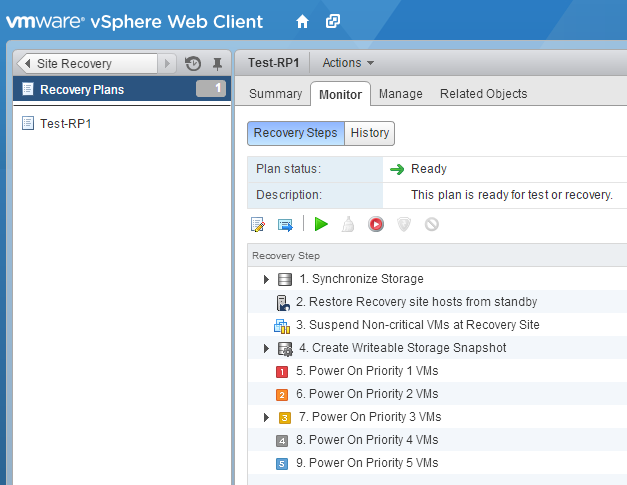 During the test, you’ll be able to monitor the recovery plan every step of the way. If you encounter a failure, you’ll know what step failed and you’ll be able to fix it and try again. Assuming everything goes as planed, you’ll get a “Test Complete” message with a check mark. 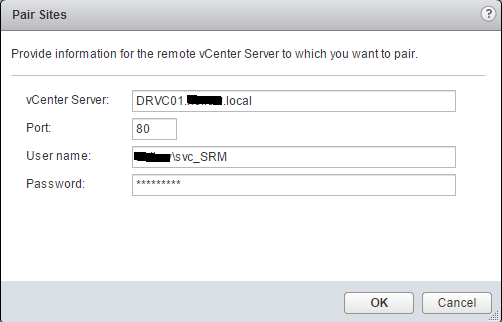 Once the test is complete you can login to some of your virtual machines to ensure things are how you expect them to be after a failover. 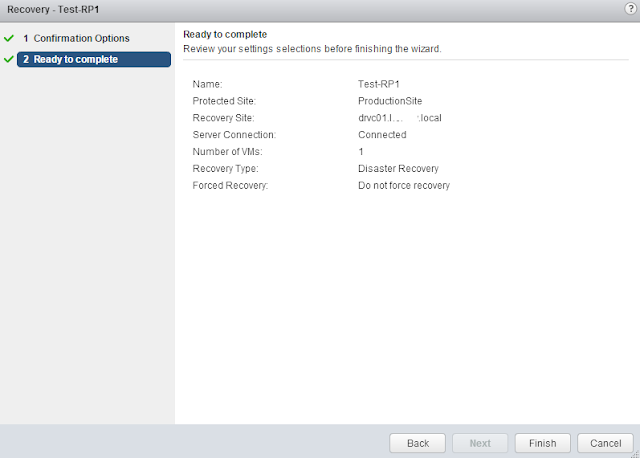 When you’re ready to finish the test, click the broom icon in the recovery plan menu. 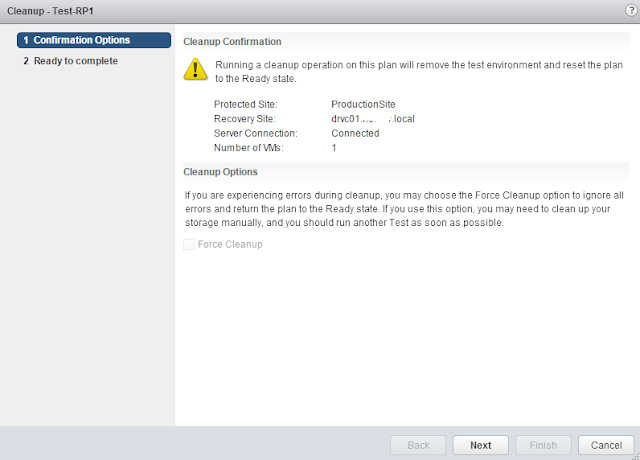 When you click the cleanup button, you’ll get a confirmation much like you did when you ran the test. Click Next. Review the cleanup settings and click Finish. 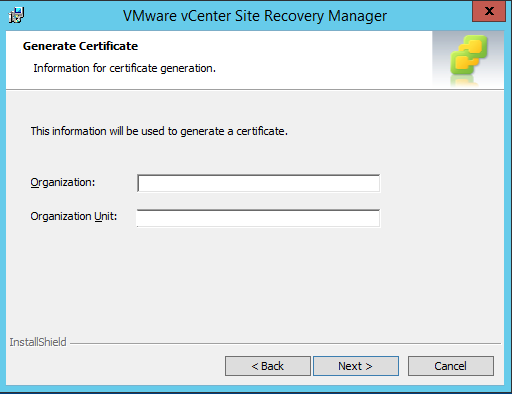 When you click Finish, the snapshots created at the recovery site will be deleted, any isolated virtual switches used for the test will be destroyed, and the placeholder VMs will be ready for another failover. We don’t have to wait for a long test window to try our DR plan any longer. We can test during the middle of the day, test once a month, week, day or hour if you really wanted to. Now we have some semblance of certainty that our DR plan will work successfully if the time arises.